The Echo Puppet is appropriate for all children but the multi-sensory features are especially important for children with an Autism Spectrum Disorder, children who are visually impaired, or children with significant cognitive or physical challenges. Puppets are one of the few toys that have lasted throughout the years as a favorite among both children and adults alike. When it comes to dealing with problems, children find it easier to work through something that is troubling them if they can externalize the problem. Puppets provide them with the opportunity to do this. 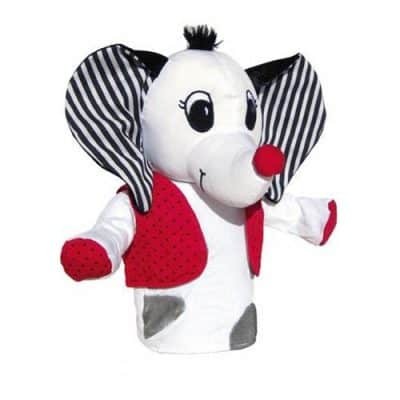 Story Buzzer – Child can squeeze Echo the Elephant’s trunk to make her trumpet every time a word is said in a story. This keeps little ears listening and adds a laugh to story time. Dress Up – Dress up Echo in other doll clothes to practice fine motor skills like buttoning, zipping, tying and pretend play. Hot & Cold – Caregiver can hide Echo and the child can search for her with the help of hot and cold hints. Hot if the child is close and cold is the child is far away! Locational – Caregiver can use Echo to encourage the understanding of locational skills– over, under, behind, next to.